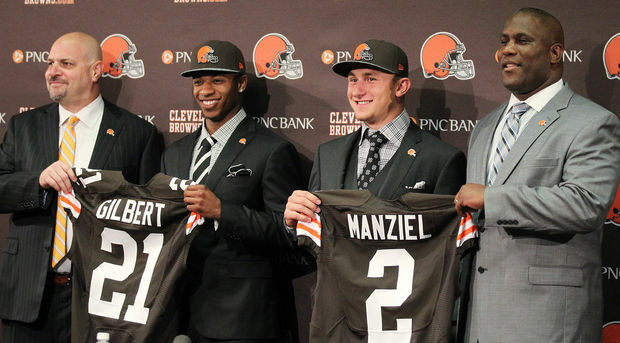 Are you ready for some (Johnny) football, Cleveland? The one big knock against Gilbert is that he may not be as tough against the run as you would like – especially considering that the Browns play in the AFC North. But that may not be as big of an issue because head coach Mike Pettine’s defense doesn’t rely on its cornerbacks to be the first line of defense in the running game. As for Gilbert, he seems ready for whatever the Browns have planned for him. As for Manziel … well, whatever happens it promises to never be a dull moment while he is in Orange and Brown. While we enjoyed watching Manziel while he was at Texas A&M, we’re still not sure we are ready to for 16 games of him. But he’s a Brown, so let’s roll! As for Pettine, he is enamored with that special quality that Manziel seems to possess on the field. Say what you will about Manziel – and make no mistake about it, there is going to be plenty said and written about him in the upcoming months – the dude knows how to get the job done on the field and light up the stadium. Anyone on the trade Hoyer train apparently hasn’t been paying attention, as the Browns have not had a single quarterback start all 16 games in a season since Tim Couch in 2001. It reminds us of last year, when there was talk that the Browns “must” trade Phil Taylor because they signed Desmond Bryant, or that they “must” trade Jabaal Sheard because they drafted Barkevious Mingo. Since when did depth at the most important position become a problem? Just as importantly, the Manziel pick was not made with Week 1 in Pittsburgh this fall in mind – this pick was made with the next 10 to 12 years in mind. Manziel doesn’t need to start Week 1 for the selection to be considered a success; so let’s just take a step back for a minute and let this thing play out. It was only the first round, but Farmer definitely won the day. Now it is up to Pettine and the players to start winning when it really counts.